Hopefully our experience will inspire other individuals and families to visit Yellowstone. Why did I pick on Yellowstone? I begin with a background story about my first visit to the Park in 1999 as well as my deep attachment to Salt Lake City since November 1979, when I first set foot there in circumstances which were fortuitous. We hope you enjoy our post – the photos (please click them for enlargements), our wonderful experiences as well as recommendations! In September 1999, I set out for a long solo trip from Toronto to Vancouver – a distance of around 4000 kilometers (or 2,500 miles), after I was out of work following the completion of a computer project in Burlington, Ontario. My attempts to secure a new contract had been unsuccessful for several weeks, and I decided to head to my parents until good fortunes came by. I was driving on 427 South to connect with the QEW when I rear-ended a small truck which stopped suddenly. A police officer driving on a service lane was at the scene within minutes and said to me: “You are at fault, sir. You should learn to keep a safe distance from the vehicle in front of you.” I argued but to no avail. 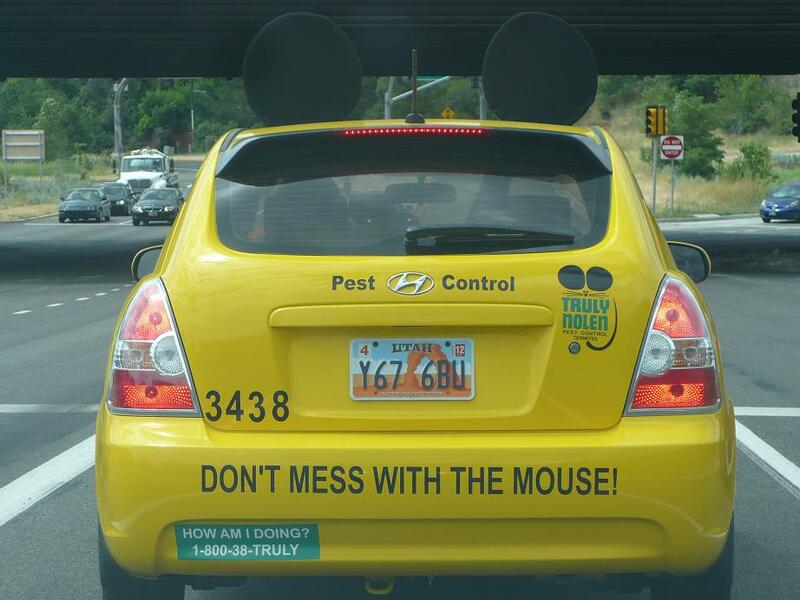 The car’s hood was damaged. Although I did not spot any coolant leaks and the car seemed to be driving well immediately after the accident, I wondered whether the damage was enough to prevent me from driving the thousands of kilometres. 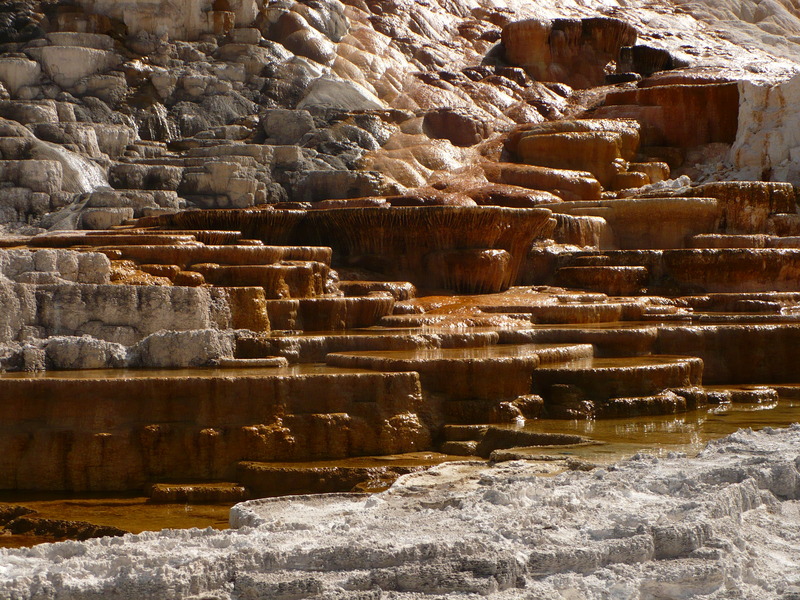 The amazing and favourite Minerva Terrace, looking like a brightly coloured orange and brown stairstep at Yellowstone’s Mammoth Hot Springs. Photo: Nurin Merchant. Copyright. I drove to Halton Honda in Oakville, and sought the service manager’s opinion. He advised me to proceed with the trip as there had been no mechanical damage to the vehicle. Would the crumpled hood open if I were to run into a pot-hole? The secondary locking mechanism was intact and safe, I was told. A sigh of relief. The ‘former’ beautiful green 1995 Honda Accord with all the bells and whistles including a 6-CD changer was packed with personal belongings at the front and the rear seats as well as the trunk. Would I be stopped at the US border and searched, or asked awkward questions? None of that happened. But throughout the trip, the hood of the car received multiple glances from speeding cars, sometimes with concerned faces as if to ask me, “Are you not aware that your car is damaged?” However, the service manager had quelled my concerns and none of what might have been expected from a damaged hood happened in the next few days of driving. 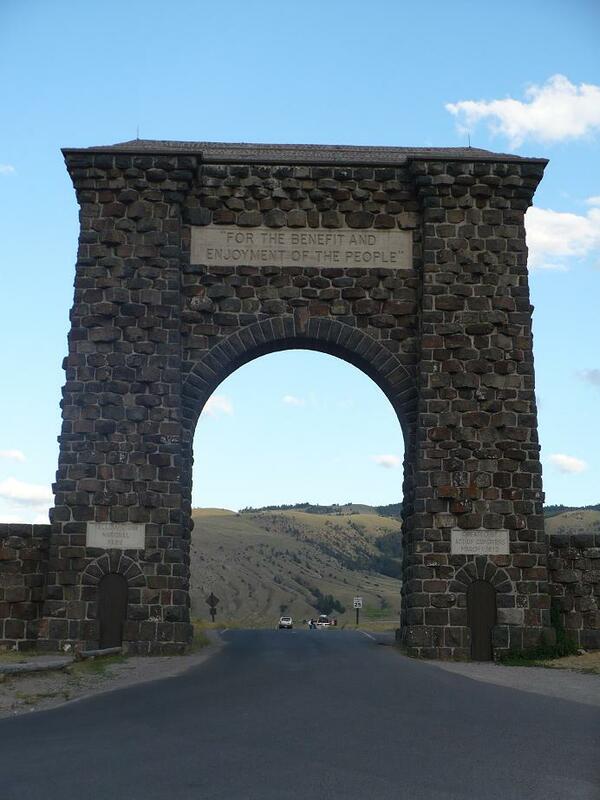 “For the benefit and enjoyment of the people,” a simple but poweful message on the arch at the North or Gardiner entrance of Yellowstone National Park. The Roosevelt Arch, whose cornerstone was laid by President Teedy Roosevelt, was built in 1903 at a cost of $10,000. The arch is 50 feet high, and the main opening is 25 feet wide. The words at the top of the arch are taken from the 1872 act that created the park. Photo: Nurin Merchant. Copyright. The distance can be covered in around 5 days with about 8 to 10 hours (or 500miles/800 kilometres) of driving each day. I decided instead to take my time to drive the length of the trip and to stop at a few landmarks, first among which was the Mall of America in St. Paul’s/Minneapolis, which is considered to be largest mall in the USA. Other stops included a small town somewhere in the Dakotas packed with antique shops. I hoped for a rare Islamic artifact. I came across lots of unique dolls, though, which reminded me of my daughter, Nurin, who was then seven. Then, in a temptation to become rich in a hurry, I vainly tried my luck one evening at a casino where I quickly made 400 US dollars on a roulette table. Greed generates more greed, and this saw my winnings disappear in a hurry at a slot machine which offered 10 times the winning amount. After that disgraceful diversion, I felt remorseful and hoped for better moments during the rest of the trip. Unexpectedly, a Middle Eastern restaurant in a very tiny town offered a great ambience and delicious food, and gave me the lift that I much sought. 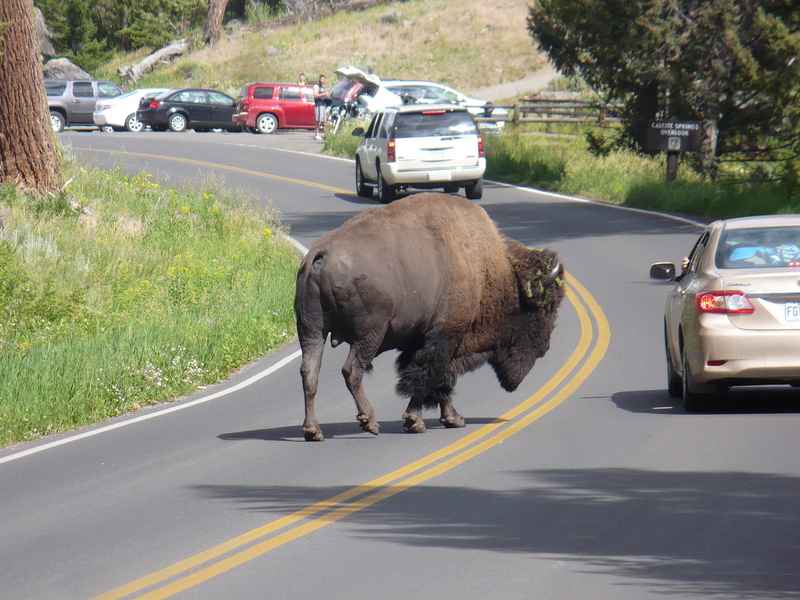 A bison or the American buffalo gaily crossing a road in Yellowstone National Park. The bison is the largest land mammal in North America. In a typical year, more than 3,000 bison roam the grasslands of Yellowstone National Park. Photo: Nurin Merchant. Copyright. Next as my drive continued, I reached the town of Bozman in Montana. After a night’s wonderful sleep in a clean motel, I spent a full morning at the American Computer Museum, which this year celebrates its 20th anniversary. Following that, I drove fifty miles south to Yellowstone’s North Gardiner entrance where a map of the Park was provided to me at the entrance. I knew at once it would be impossible to cover the Park in a single afternoon of driving. Thus, I spent another full-day in the Park, booking myself for an overnight stay at the historical Old Faithful Inn. Considering the breath, scope and diversity of the park with its rivers, lakes, water falls, a grand canyon, wildlife, hundreds of geysers as well as superb scenery, I could simply not finish seeing the Park. 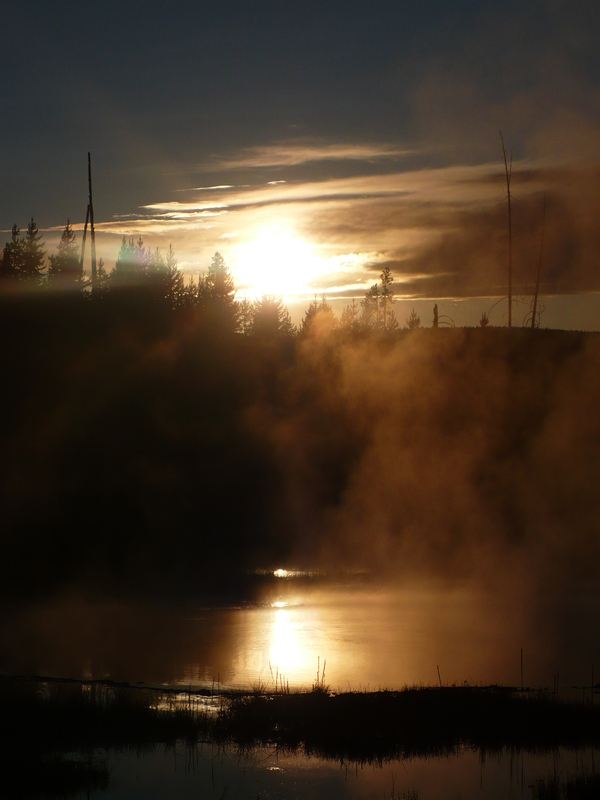 The Yellowstone experience, in just 1 day and a half, left me breathless. It was an overpoweing experience. I then promised myself that I would return to it one day, but not without my daughter, Nurin. I had never seen a park in my life packed with so many things to see and do, and in the time I spent there I barely covered seventy miles out of a total driving distance of 500 miles that make up the Yellowstone driving routes. Three days at the minimum would be required to cover Yellowstone adequately. Thus our recent trip, twelve years after my eventful drive from Toronto to Vancouver via the United States, was planned accordingly. 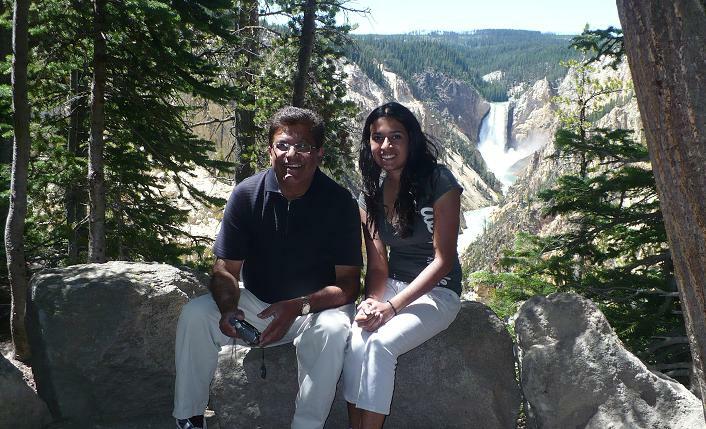 A visitor takes Nurin’s and Malik’s picture at the Grand Canyon of Yellowstone. The photo was taken at “Artist Point” which provides breathtaking views of the Canyon and surrounding areas as well as the Lower Falls and the Yellowstone River. Photo: Simerg. Copyright. After about four years of promises to my daughter I finally brought Nurin to Yellowstone, not by car, though. We drove the three hours from Ottawa to Syracuse, and flew by Delta Airlines into Salt Lake City with a brief stop-over at Detroit Airport where a Light Tunnel connects Concourse A with Concourse B/C in the McNamara Terminal. 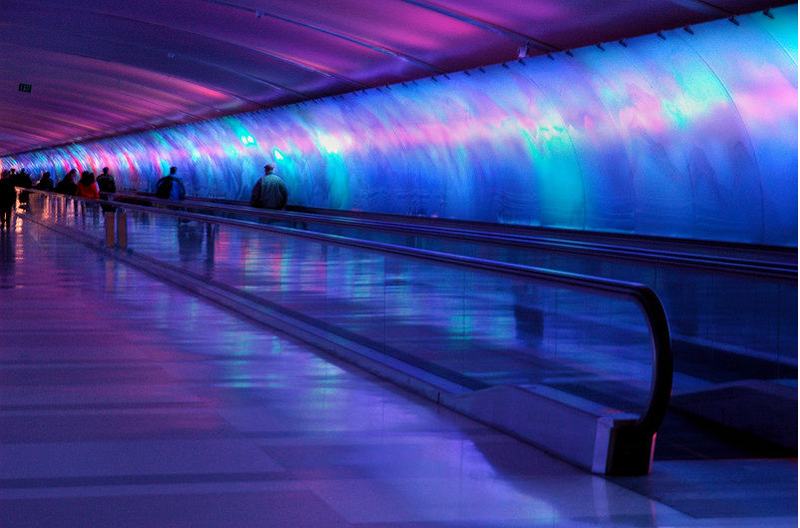 The tunnel features an elaborate multi-colored light show behind sculpted glass panels extending the entire length of the walkway, as well several moving walkways. The light patterns along the tunnel are choreographed with music which runs for nearly a half hour before repeating. The airport probably deserves the prize for the most exciting walk between terminals. As the plane approached Salt Lake City, I shed a couple of private tears as I realized how much that place had meant to me some 31 years earlier in 1979-1980, when I was a newbie in my computer career. While in England, I had obtained an H3 visa to work in the USA through a sofware and consulting company, Informatics. I had flown into New York City sometime in November 1979, where for the first week I was asked to familiarize myself with IBM’s JCL (Job Control Language which is used to execute programs) – my UK experience had primarily been on ICL machines. Then one late afternoon I was called into the director’s office who presented me with an airline ticket and a cash amount of $300.00. “Malik, you are leaving for Salt Lake City tomorrow. Our company is working on a Payroll/Personell system for the client [Skaggs Incorporated] and two people have been let go, and we need you to fill one of the positions. Please do a good job.” What? When I returned to my desk a little bit stunned and told my colleagues about my departure the next day, they added more agony and anxiety as they teased me, “so you are off to LDS country.” Did I get that right? Were they saying LSD? Education, Malik, education! It is vital. The Mukhi in New York Jamatkhana that evening told me he wasn’t aware of any Ismailis in Utah. Okay! 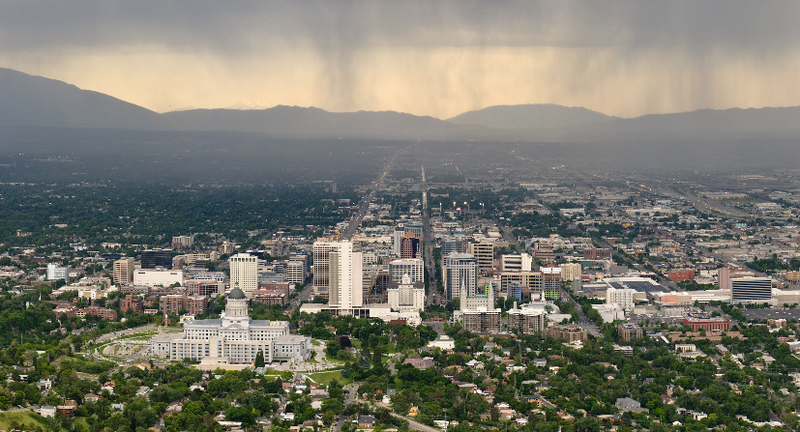 A panoramic view of downtown Salt Lake City. Photo: Wikipedia. I departed for a place totally unknown to me but Salt Lake is where I gained my rewards and self-confidence due to some excellent mentoring from my senior project leader at Skaggs by the name of Charles Holupka – a devout member of Jehovahs Witness – as well as some wonderful people and friends I made including Dave Brooks, Adrian O’Conner (Informatic’s team lead in Salt Lake), Jerry Metelnicki (1942-2012) of Kansas, Jim Goluch, Robert Thompson, Gary Rupp and a few others. There was also a dazzling girl the consultants called “Dallas” for her looks, equating her to some of the “Dallas Cowboys” cheerleaders. Honestly, I knew nothing aout the “cheerleader” concept because there were none at football (I mean soccer) games in London. One Bangladeshi, on the project – we called him Jay – had his heart beat quicken every morning as “Dallas” walked by our office. Then one day around Christmas time, he set up a mistletoe in our office as a trap to kiss her if she sneaked in. “Dallas” glanced at it, and probably thought it was meant for someone else. Another, equally charming young lady took the brunt of it in a fine spirit. No one except Jay had the guts. The computer program I wrote was very complex, as it performed intricate manipulations of an indexed file. At the end of a highly successful project – at least my portion – Holupka presented me with a “nerd” certificate for being so technically wrapped up in my work! The absence of a Jamatkhana and members of the Ismaili community made my life a little bit of a struggle in Salt Lake City, but I think I had gained immensely from some of my spiritual practices that I had established a few months earlier in London, England, under my parents guidance, and above all by the grace of Allah and the blessings of Mawlana Hazar Imam. The rising of a new moon every month above the mountains made my heart glitter with happiness, as it marked Chandraat and the commencement of a new Muslim month. Indeed, on every Chandraat I would recollect the late 48th Ismaili Imam’s firman (guidance) on the potential benefits and spiritual rewards of the night. Upon arriving at Salt Lake City airport on the evening of July 16th, 2011, we picked up our rental car. A shaby and dirty Toyota Camry was offered to us. The Avis car rental’s computer system was down. There weren’t better alternatives available at that time and I grudgingly accepted it, but not before it was washed and cleaned and appeared respectable. As soon as we had checked into the fine Monaco Hotel, we contacted Andrew Kosorok, who is constructing glass sculptures representing the 99 Islamic Names of Allah. I had been in communication with him since publishing his articles and sculpture images on this blog. Andrew Kosorok (left) gave us a comprehensive tour of Temple Square. Andrew, a former Mormon missionary, is an artist and currently sculpting the Islamic 99 Names of Allah as he interprets them in imagery. Please see link following this post to his article and sculpture photos on this Web site. Our wearing of similar blue shirts was not pre-arranged- it was “foreordained”! Photo: Nurin Merchant. Copyright. He had kindly offered to travel from Provo and give us a tour of the Mormon Temple, which was just two blocks from the hotel. Andrew was a missionary with the Church, and on Sunday morning, July 17, provided some excellent insights into the history, doctrine and ethic of the Mormon faith. The “tithe” card that he showed us was particularly interesting – it is used to record contributions that Mormons make through noble actions and endeavours that are counted as tithing. 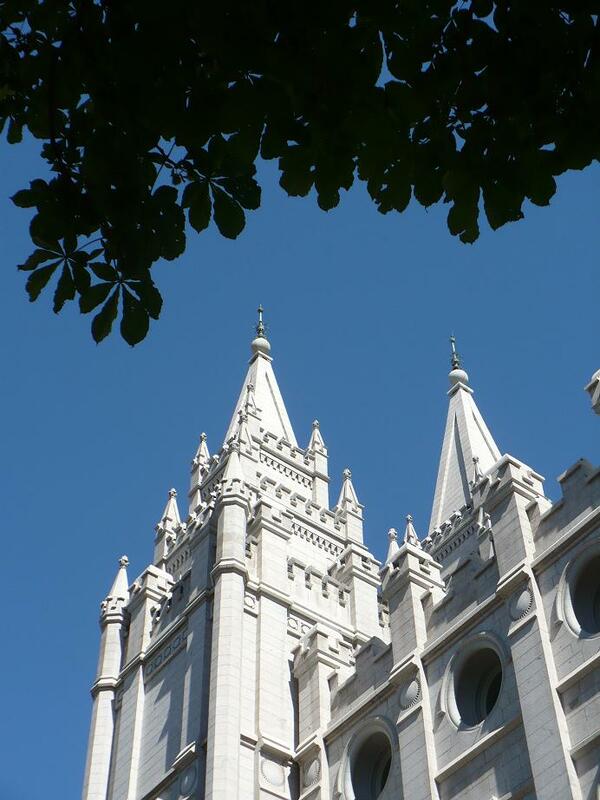 My daughter in between listening and asking questions took pictures of the Temple from the outside. In all, for the entire 12 day trip, Nurin captured two thousand images and recorded several excellent video clips. We shall share some selected ones with our readers. 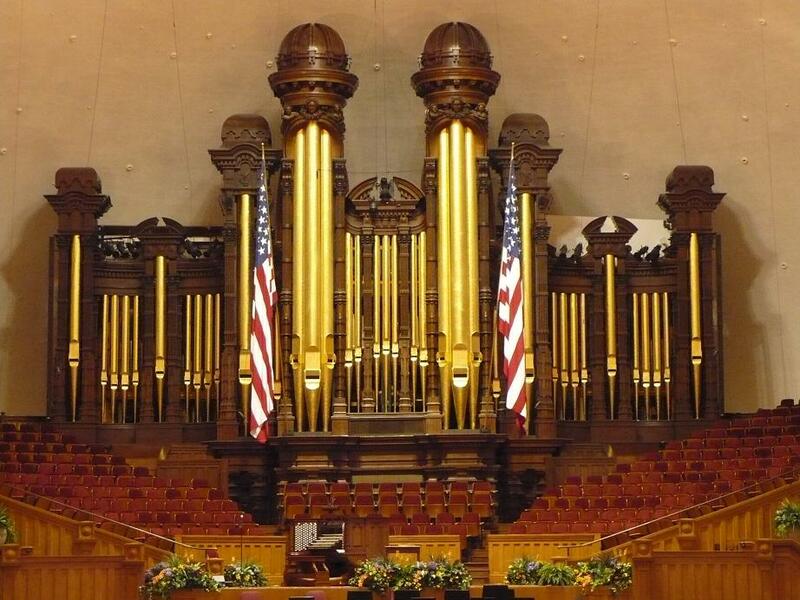 The spiritual centre of the Mormon Faith – the Mormon Temple in Salt Lake City. Photo: Nurin Merchant. Copyright. A non-denominational assembly hall located in the precincts of the Mormon Temple in Salt Lake City. Photo: Nurin Merchant. Copyright. 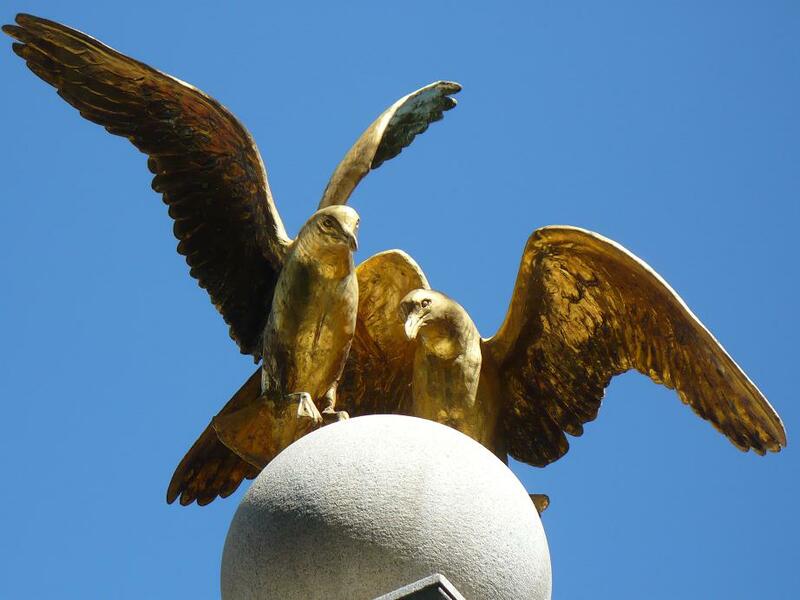 A sculpture of two seagulls at the Mormon Temple in Salt Lake City. Seagulls were said to have prevented famine by devouring a large swarm of locusts that had nearly eaten crops that the community needed to survive. Photo: Nurin Merchant. Copyright. The Salt Lake City Mormon temple is the largest of the Mormon faith’s 134 operating temples around the world. Rich symbolism adorns the exterior of the building, depicting mankind’s journey from mortality into the eternal realms. 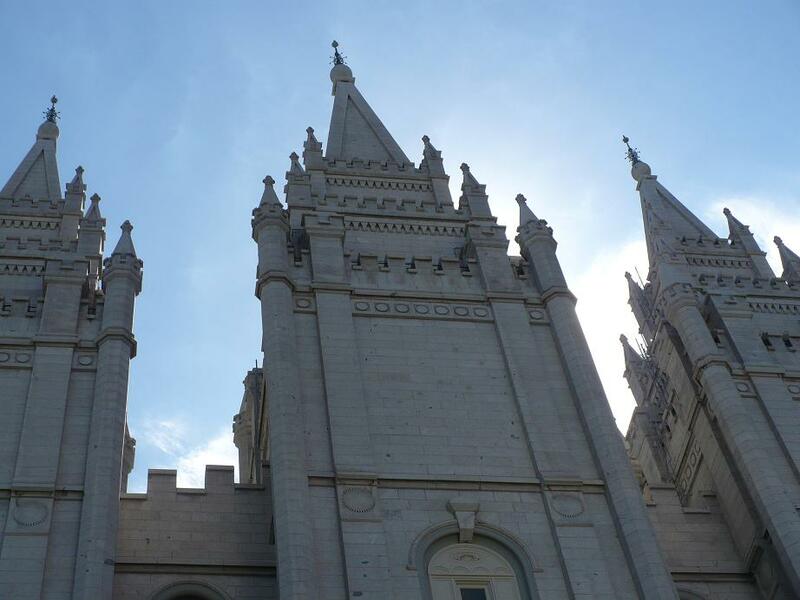 The Mormons see each temple as “lifting us, exalting us and standing as a beacon for all to see, and pointing us toward celestial glory.” A Mormon temple, once dedicated, is restricted to members of the Church. 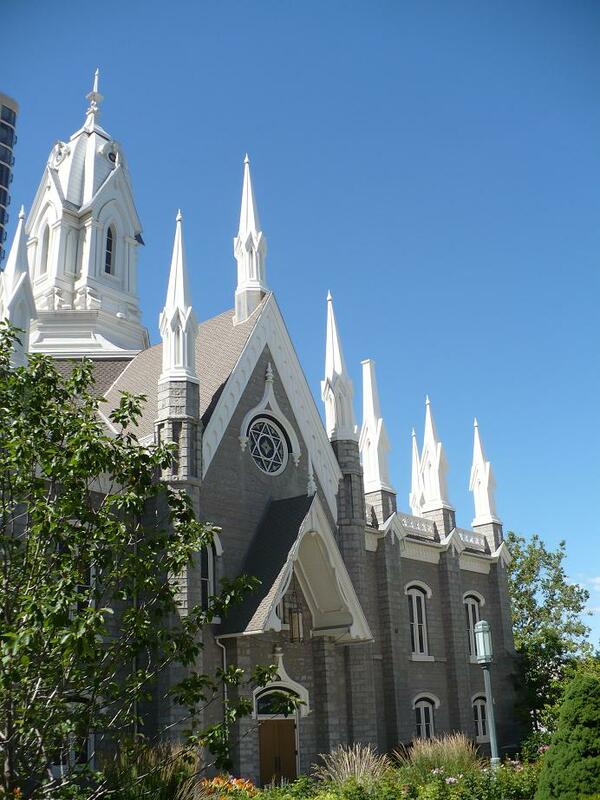 Positioned on Salt Lake City’s center block, known as Temple Square, the spires of the Salt Lake Temple rise amid downtown high-rises and super malls. Sharing the block are the North Visitors’ Center and South Visitors’ Center; the Tabernacle, home of the famous Mormon Tabernacle Choir; and the Gothic-style Assembly Hall. We missed the Tabernacle’s performance on Sunday morning but were able to capture photos of the hall and the grand organ. Another view of the Mormon Temple located in Salt Lake City’s Temple Square, which serves not only as a cultural center for the Salt Lake City metropolitan area, but also as the most popular tourist attraction in the state of Utah. Photo: Nurin Merchant. Copyright. 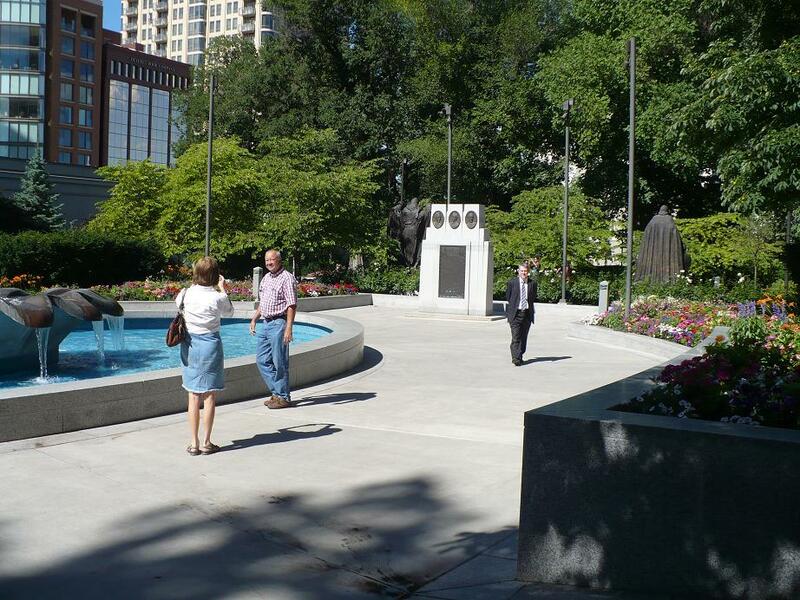 The gardens adjacent to the Mormon Temple’s visitor’s centre located in the south end of Temple Square. There is another elaborate visitor centre at the North End. Photo: Nurin Merchant. Copyright. 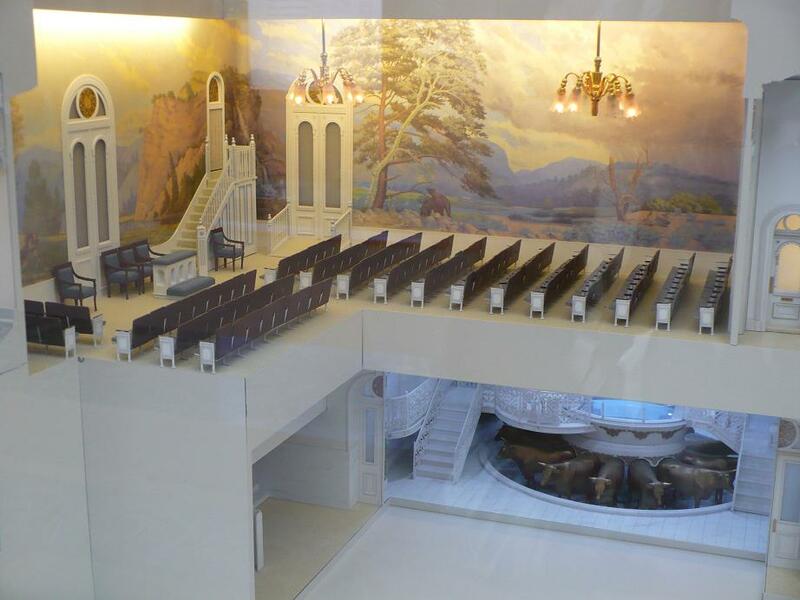 A model of an inside segment of the Mormon Temple. The exhibit is displayed as part of the Temple’s history at the South Vistor’s centre. Access to the temple is restricted to adherents of the Church of Jesus Christ of Latter Day Saints or the Mormons. Photo: Nurin Merchant. Copyright. We then headed to a Brazilian restaurant in Trolley Square, which we would highly recommend. As we took our seats by a window, we were first presented with a small wooden cylinder-like object with different colours at its horizontal/vertical ends. “Do you know what this is?” the waiter asked. It looked like a salt/pepper shaker. He explained its purpose: “Turn it vertically to the green mark and waiters will show up with skewers of different meats. If you want a break, simply turn to the ‘red’ to indicate that you are busy with the food on your plate.” Of course, at times we forgot to change the colours and this resulted in two or three waiters showing up simultaneously at the table with meat skewers. When we were all done we put the object flat and the bill promtly arrived. I could have saved twenty dollary, as the charge was for only the two of us. I pointed out the error. After the lovely meal Andrew gave us a ride back to our hotel which was about 10 blocks from Trolley Square. We were sorry to leave him after a memorable experience at Temple Square. Nurin and I were then on our own for the rest of the afternoon. 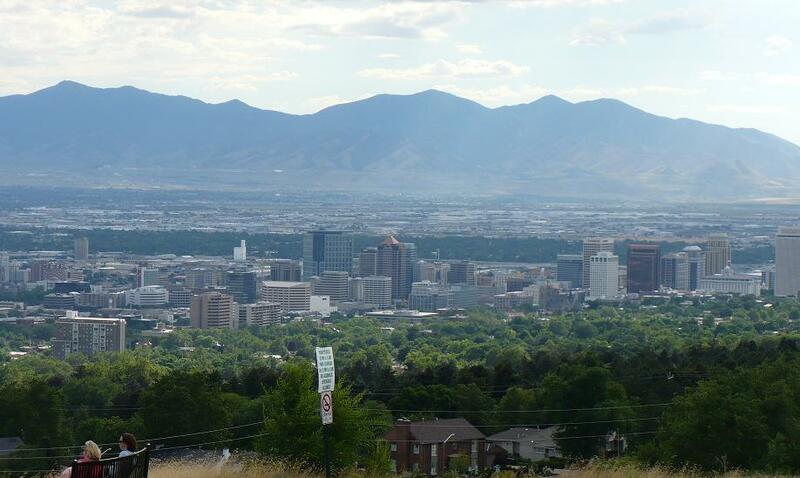 A view of the Salt Lake Valley from the campus of the University of Utah. Photo: Nurin Merchant. Copyright. Despite the immense heat, which had peaked 90+ degrees, how could I deprive my daughter of a shopping experience? Instead of resting at the hotel, we got on our feet and first headed to the excellent nearby Gateway Mall – all shops outdoors – and then drove up to the University of Utah from where we took some marvellous photos of the Salt Lake Valley beneath us, drove by the University’s Huntsman Cancer Institute and took the opportunity to view some superb homes! On the way down, we saw a cricket game in progress – “it loks like the entire South Indian community is here,” remarked Nurin – but my interest faded when I saw the players engaged in the game with a tennis ball. The setting of the ground, with the Salt Lake Valley below was superb. The Flags of the United States of America and the State of Utah at the Utah State Capitol. The Utah flag (all details not captured above) has a blue field on which appears the state seal. In the center of the seal is a beehive, the state emblem, with a sego lily growing on either side. The sego lily stands for peace. The state motto “Industry” (visible above) means steady effort. 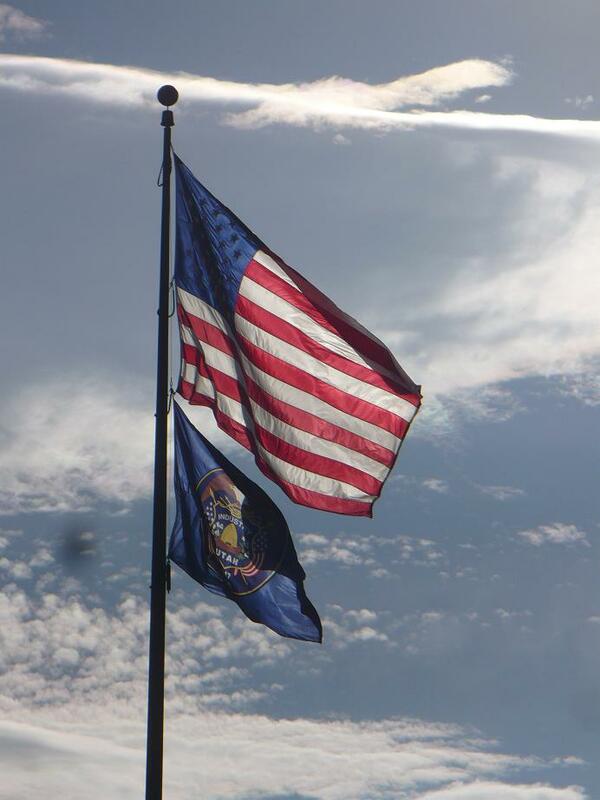 A national flag around it shows that Utah supports the United States. The eagle stands for protection in peace and war. There are two dates on the flag. 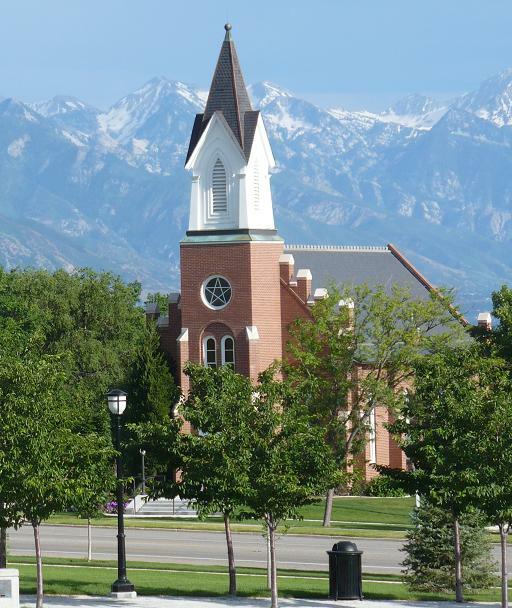 The date 1847 represents the year when Brigham Young led a group of people to the Salt Lake Valley to re-establish in Utah, the Church of Jesus Christ of Latter day Saints, also know as The Mormons. The date 1896 represents the year that Utah gained admission to the Union of the United States. Photo: Nurin Merchant. Copyright. 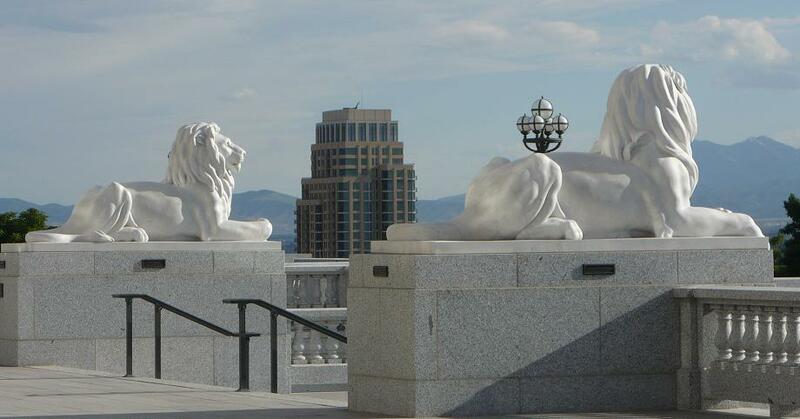 New lion sculptures at Utah’s State Capitol. They were sculpted in Italian marble by Nick Fairplay, a master carver. Photo: Nurin Merchant. Copyright. 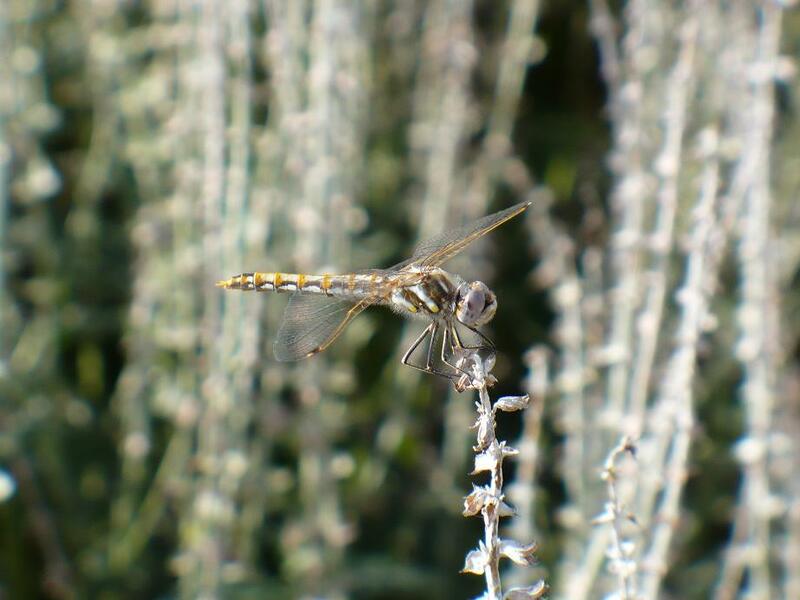 A dragonfly precariously perched on a plant in a garden on the Utah State Capitol grounds. Photo: Nurin Merchant. Copyright. Utah State Capitol Building. Photo: Nurin Merchant. Copyright. 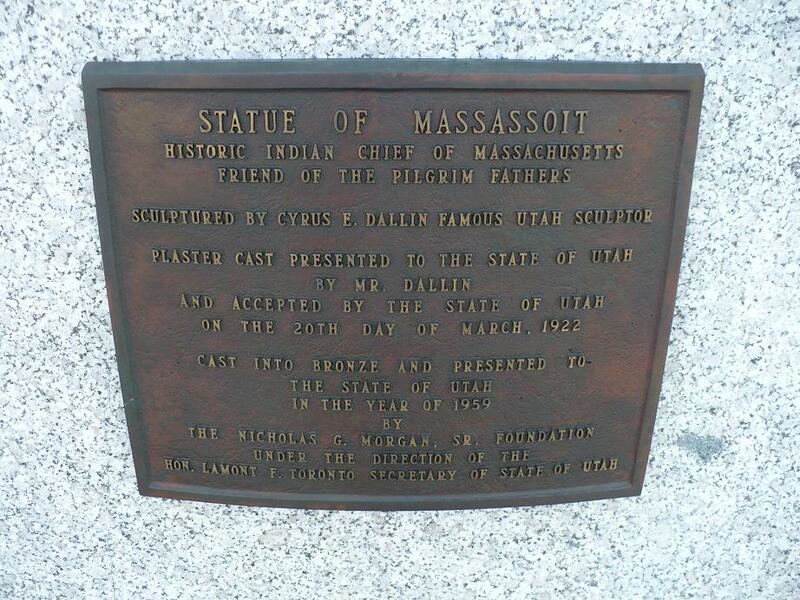 A plaque at the Utah State Capitol commemorating a great Indian Chief. Photo: Nurin Merchant. Copyright. 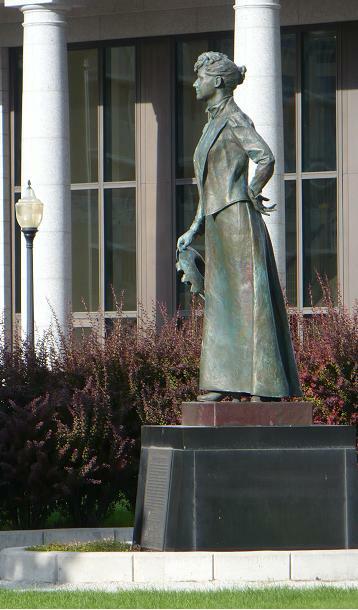 A statue at the Utah State Capitol honouring the contributions of a dynamic woman. Photo: Nurin Merchant. Copyright. 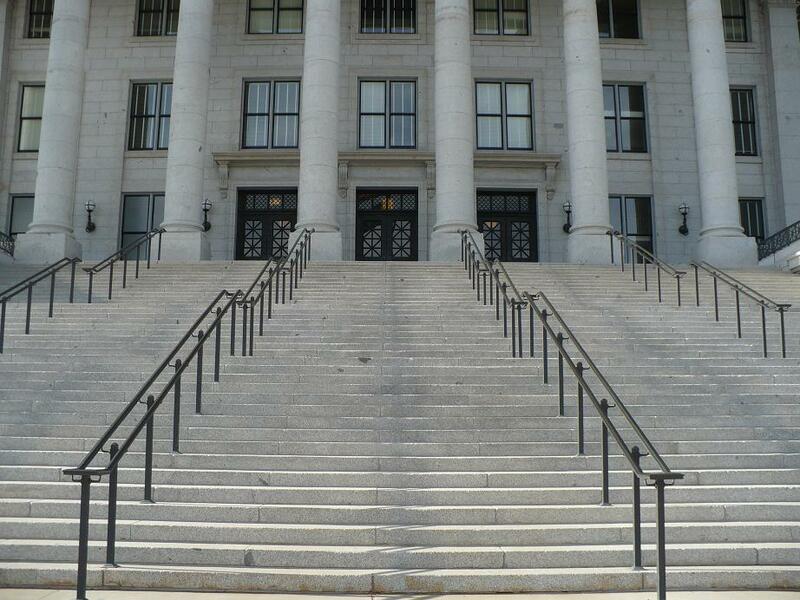 Stairs leading to the main entrance of the Utah State Capitol. Photo: Nurin Merchant. Copyright. A special day in the lives of a newly married couple as they have photographs taken at the Memory Grove Memorial near the Capitol. “Wouldn’t the couple wish to have this photo?” we wondered, as we watched the excited bride from a look-out point across the State Capitol building. With quaint bridges and monuments, Memory Grove Park on Canyon Road provides one with an abundance of beautiful backdrops and picturesque landscapes that are ideal for photographs and wedding ceremonies. Photo: Nurin Merchant. Copyright. A view of the Wasatch Mountain Range from the Utah State Capitol. In the foreground is the 1980 White Memorial Chapel, a reproduction of an earlier chapel belonging to the Mormons. The building is now used for weddings and is in constant demand. Andrew Kosorok designed (and his company built) the “White Memorial Chapel” window over the door! Photo: Nurin Merchant. Copyright. 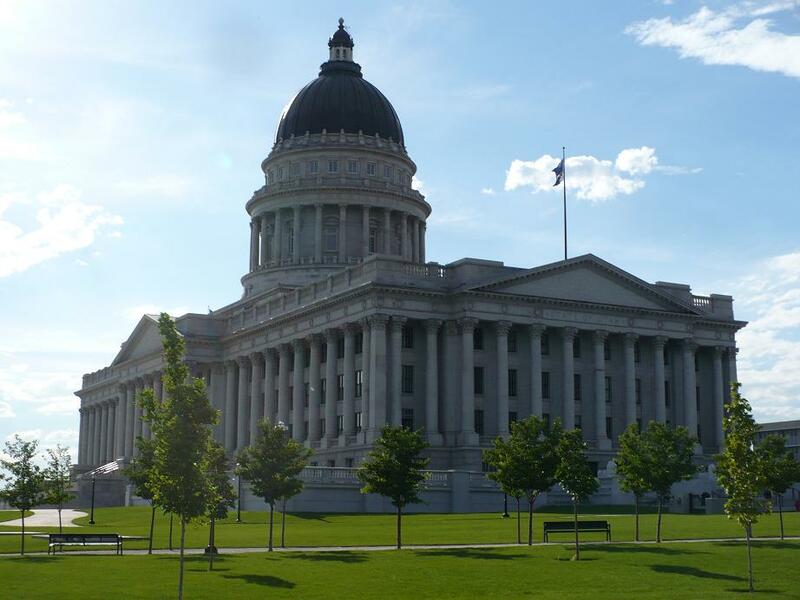 Our next stop was at monumental State Capitol near the downtown core, and we had enough time in the evening to drive to the Great Salt Lake’s attractive Antelope Island, about 50 miles away. A very well travelled gentleman we had met at breakfast had suggested the Lake – known as America’s “Dead Sea” – may not be worth a visit but we are absolutely convinced it is worth a visit for its over all beauty, features and the fact that it is the largest Salt Lake in the Western Hemisphere. The lake provides habitat for millions of native birds, brine shrimp, shorebirds, and waterfowl, including the largest staging population of Wilson’s Phalarope in the world. We dipped our feet in the lake – and tasted its water – and from a distance watched swimmers floating in the lake, where drowning in a normal sense is impossible. 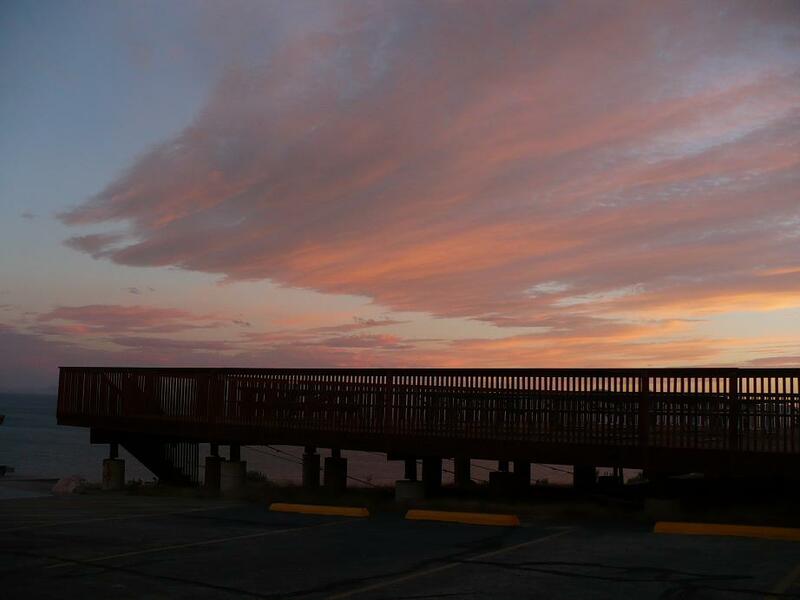 We drove around the island and observed some magnificent views of the sunset from different vantage points. A truly enjoyable place. 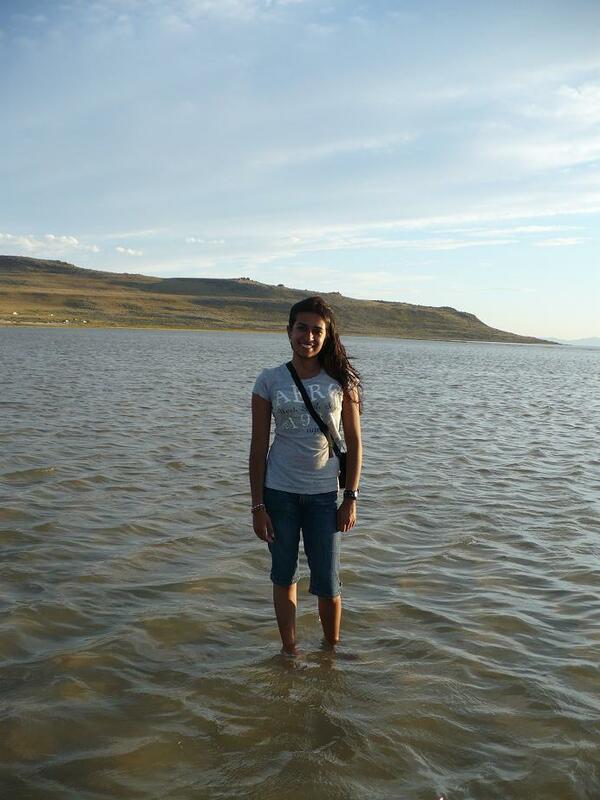 Nurin dipping her feet in the world’s second saltiest lake, Utah’s Great Salt Lake. Note the shallow water despite the distance from the shore. The lake is shallow with a maximum depth of approximately 33 feet and the lake’s area varies due to its shallowness. In an average year the lake covers an area of around 1,700 square miles, with a length of 75 miles and a width of 51 miles. Photo: Malik Merchant. Copyright. Wildlife at Antelope Island at the Great Salt Lake. Photo: Nurin Merchant. Copyright. 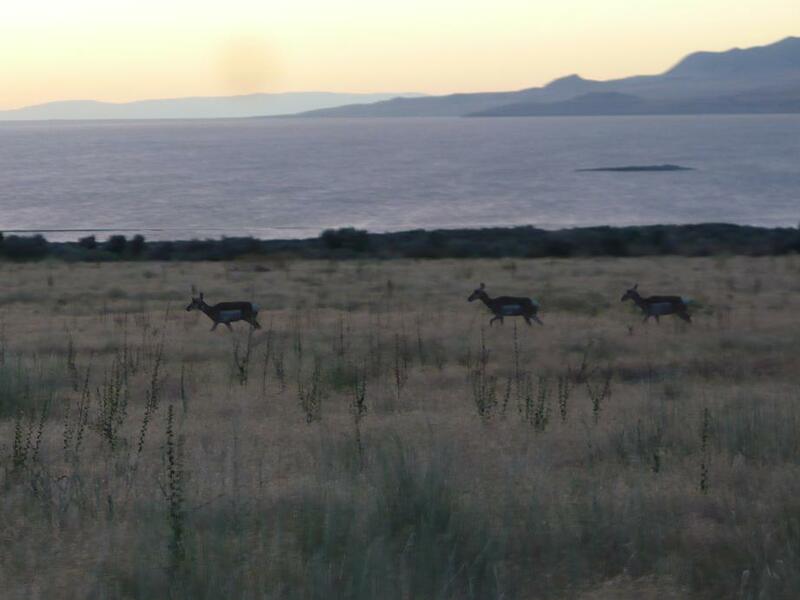 The serinity of the Great Salt Lake and Antelope Island at dusk. Photo was taken from the Buffalo Point lookout and picnic area. Photo: Nurin Merchant. Copyright. 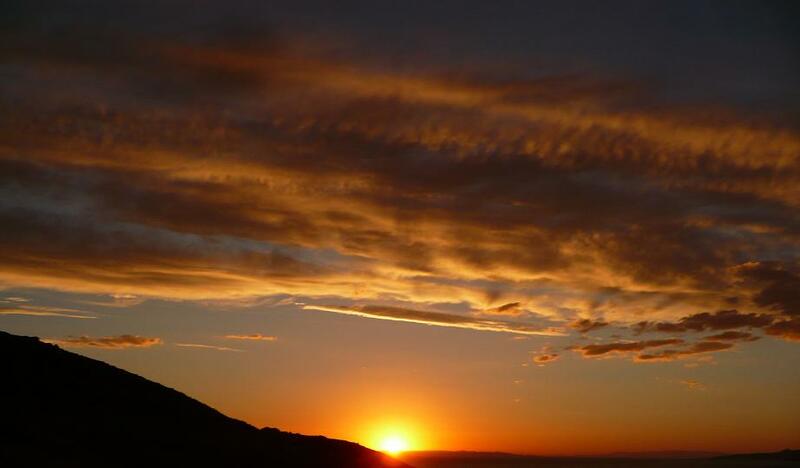 A moment to behold – Sunset at the Great Salt Lake. Photo: Nurin Merchant. Copyright. 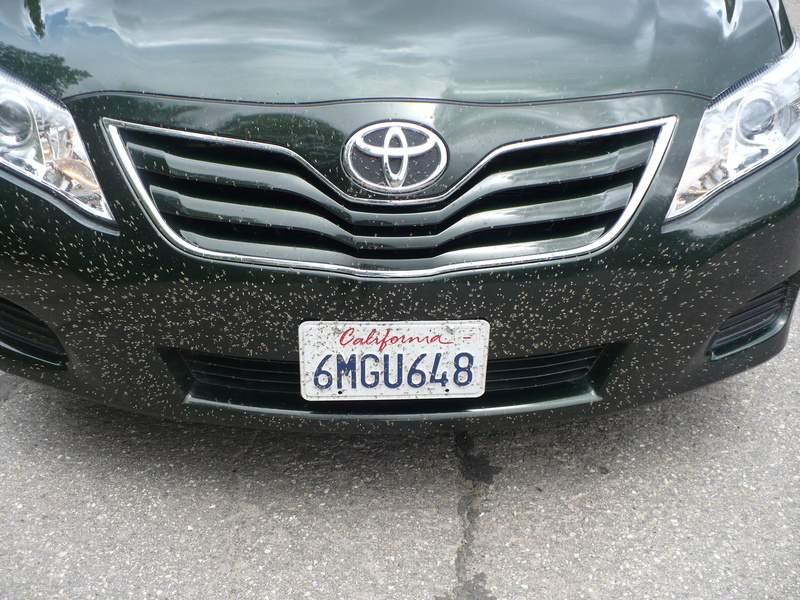 After our visit to Great Salt Lake, we noticed that our Camry had been absolutely plastered with Brine Flies that inhabit the Great Salt Lake. Photo: Nurin Merchant.Copyright. The terrace at Antelope Island’s Buffalo Point lookout and picnic area. Photo: Nurin Merchant. Copyright. 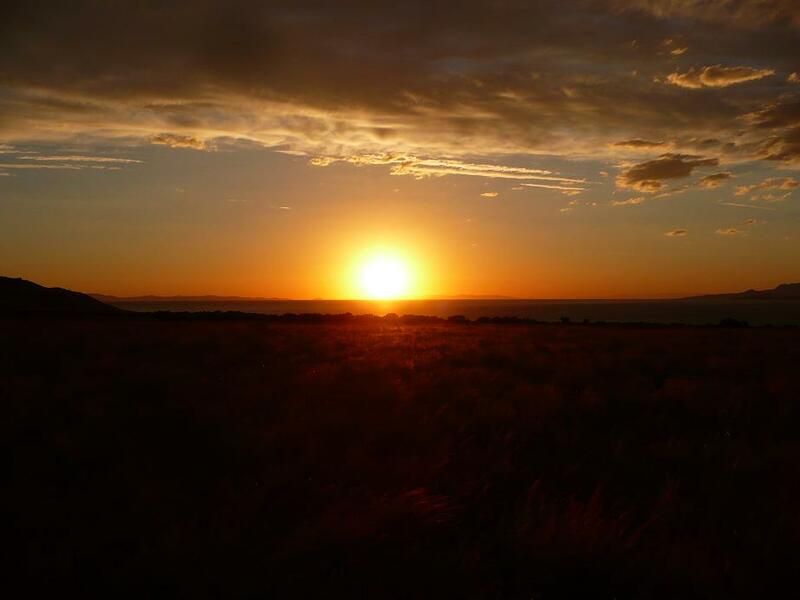 Another shot of the sunset at the Great Salt Lake. Photo: Nurin Merchant. Copyright. Antelope island also has herds of bisons and deers, and this gave us a little bit of a taste of the wildlife that we would see at Grand Teton and Yellowstone in the days to follow. Whatever other visitors might have to say about the merits of visiting Antelope Island, the Great Salt Lake and the stench, we both felt it is must be on everyone’s itenary. In my opinion the Great Salt Lake deserves the accolade of a National Park. 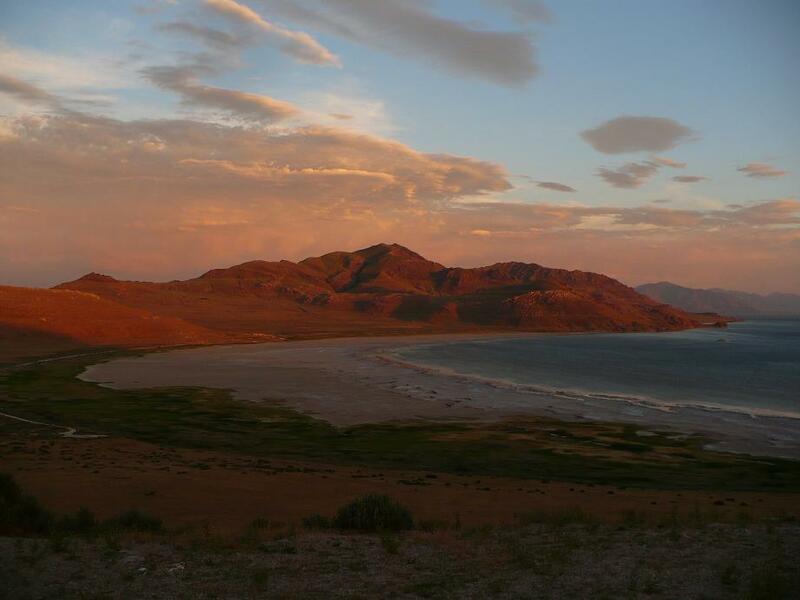 Nurin felt, though, that it does not deserve that status because there isn’t much more to do beyond spending a few hours driving around Antelope Island and taking a dip in the lake. 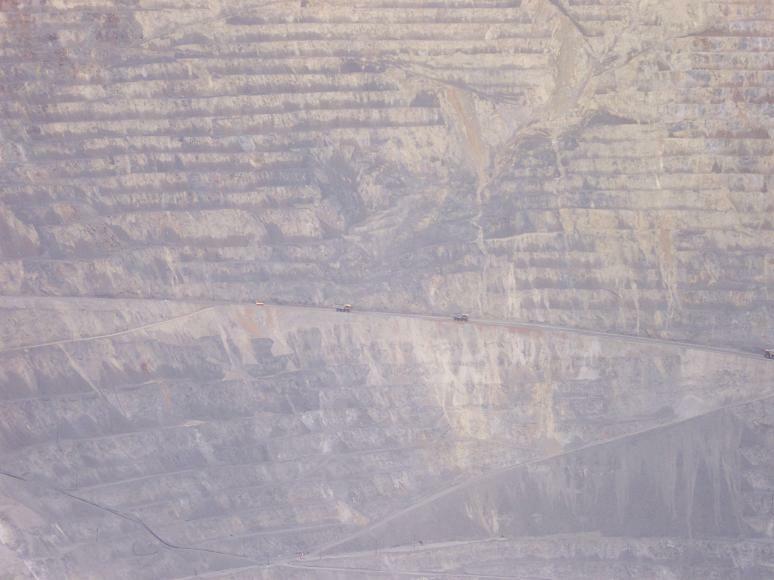 The Kennecott Copper Mine outside Salt Lake City, one of the two man-made structures that can be seen from the space high above. Photo: Nurin Merchant. Copyright. 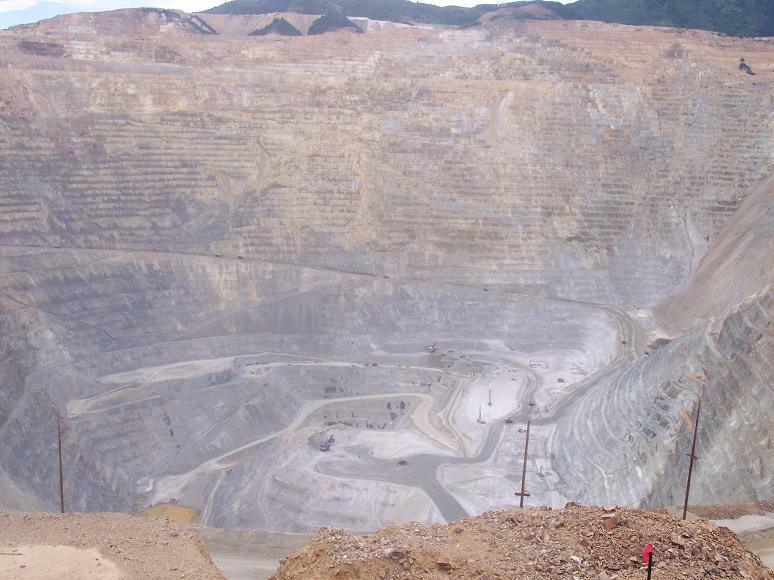 Though not in the original plan, the valet lads at the excellent Monaco Hotel strongly recommended that we visit the Kennecott Copper Mine, one of the largest open-pit copper mines in the world, which is located in the Bingham Canyon outside Salt Lake City. The 23 mile drive took us about 45 minutes. And what a fascinating and educational outing this turned out to be. 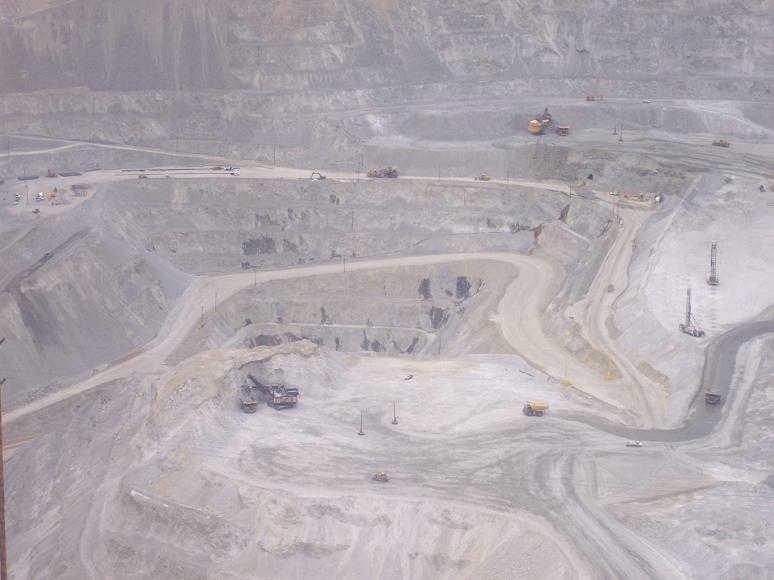 The mine has produced more copper than any mine in history – about 18.7 million tons. 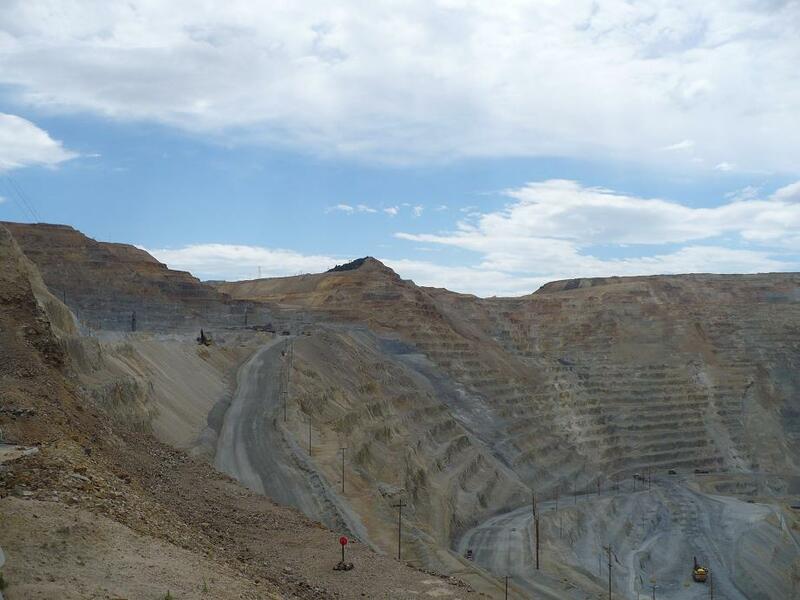 Kennecott is 2-3/4 miles across at the top and 3/4 of a mile deep. Thus you could stack two Sears Towers (now known as the Willis Building) on top of each other and still not reach the top of the mine. If you stretched out all the roads in the open pit mine, you’d have 500 miles of roadway – enough to reach from Salt Lake City to Denver or to cover the roads in Yellowstone National Park. When all the roads used by the mine’s utility vehicles are stretched, they total a length of 500 miles, the distance from Salt Lake City to Denver. Photo: Nurin Merchant. Copyright. The giant electric shovels in the mine can scoop up as much as 98 tons in a single bite — about the weight of 50 cars. The newest electric shovels each cost more than $20 million and weigh 3.2 million pounds. The trucks that haul the ore are larger than many houses and weigh more than a jumbo jet. They stand over 23 feet tall and can carry from 255 to 360 tons of rock. The truck driver rides about 18 feet above the ground — nearly two stories high. 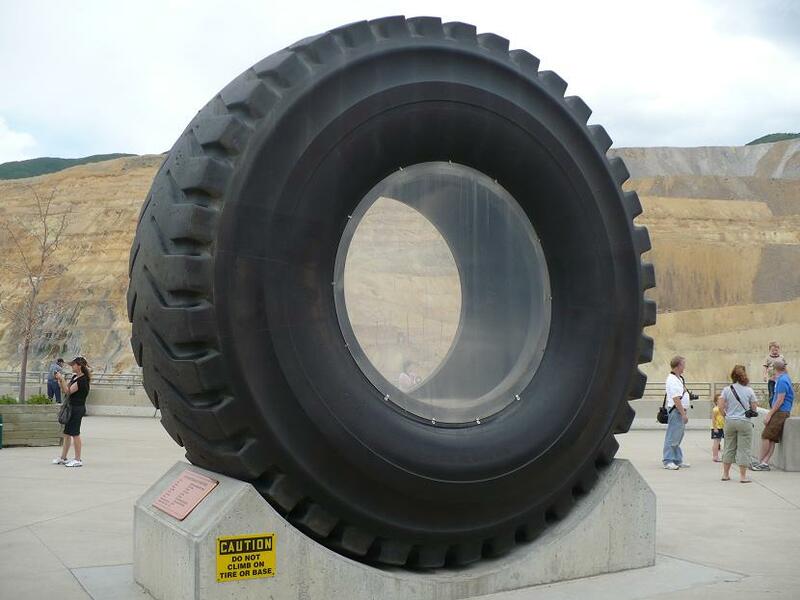 Each tire on these big trucks costs from $18,000 to $26,000 and lasts just 9 months. The crusher in the pit takes in about 140,000 tons of ore every day and grinds it into chunks smaller than the size of a basketball. At 1,215 feet tall, the Kennecott smokestack is the highest structure in Utah. Finally, the Kennecott Copper Mine, the world’s largest man-made excavation is so big, it can be seen from space shuttles in outer space. Nurin’s fascinating photos of the copper mine tell the story. 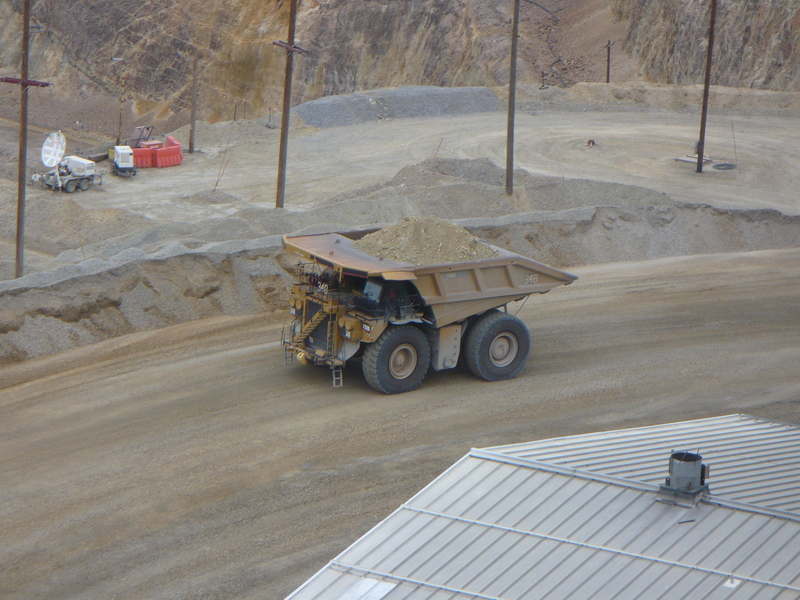 Although from far this truck looks like a small Tonka Truck toy, it is actually approximately the size of a small house and can carry up to 360 tons of rock. Photo: Nurin Merchant. Copyright. The ‘Michelin’ tires used in trucks (see photo above) to carry mine excavations. Tires need to be changed every 9 months. Photo: Nurin Merchant. Copyright. Another view of the Kennecott Copper Mine. Photo: Nurin Merchant. Copyright. A photo from a distance showing gigantic trucks moving around the mine roads. Photo: Nurin Merchant. Copyright. Having lived in Sandy, Utah, in 1979 and appreciating the drive to the Snowbird Ski Resort then, I decided to do likewise, albeit in summer conditions. Being tired doesn’t help, but the drive to the ski resort was exhilarating with deep canyons on either side of the road. Robert Redford’s popular Sundance Resort was a couple of mile’s ahead but we decided to turn back once we got to Snowbird and drove to the Tracy Aviary located in Salt Lake City’s Liberty Square. On the way to the bird sanctuary, an eye catching “Hyundai” brought smiles to our tired faces. Little incidents and events have an energizing effect and we were ready for the bird sanctuary on another hot sunny afternoon. The slogan says it all. Photo: Nurin Merchant. Copyright. Nurin’s favourite TV shows are animal related, and Tracy Aviary was a treat for her. 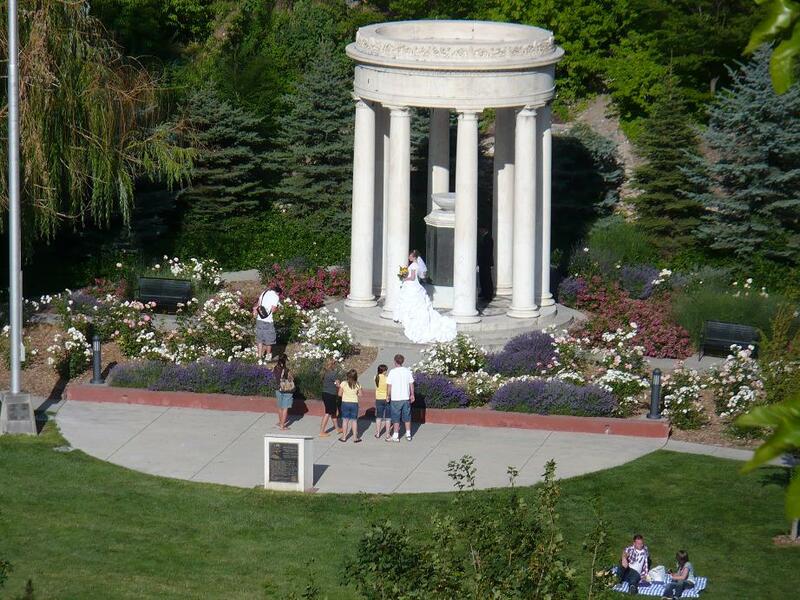 The sanctuary is on eight acres of land in the heart of Salt Lake City. A charitable act by Salt Lake City banker Russell Lord Tracy founded Tracy Aviary when he donated his private bird collection to Salt Lake City and its children. Open to the public since 1938, Tracy Aviary maintains a collection of approximately 400 birds representing about 135 species. Many of these birds are considered rare or endangered. 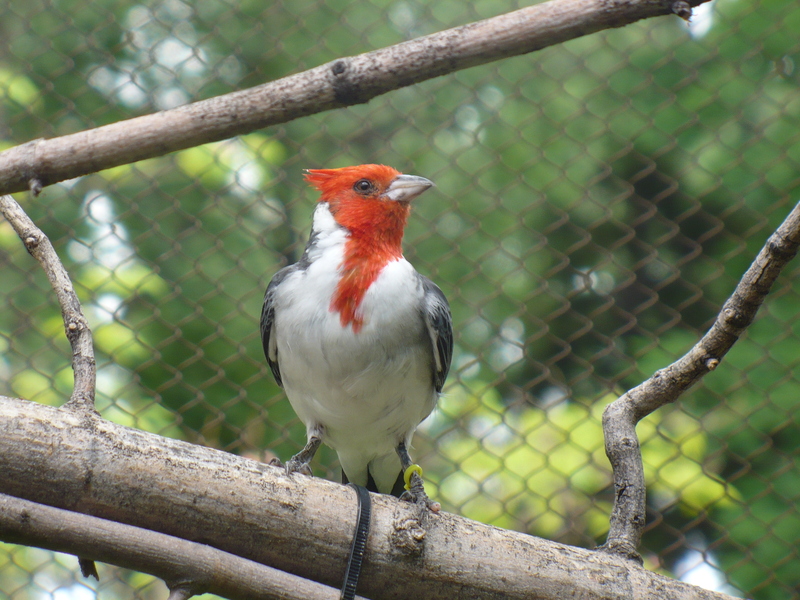 Red Crested Cardinal perched on a branch at Tracy Aviary. Photo: Nurin Merchant. Copyright. A goose protecting eggs that she thinks are her own. 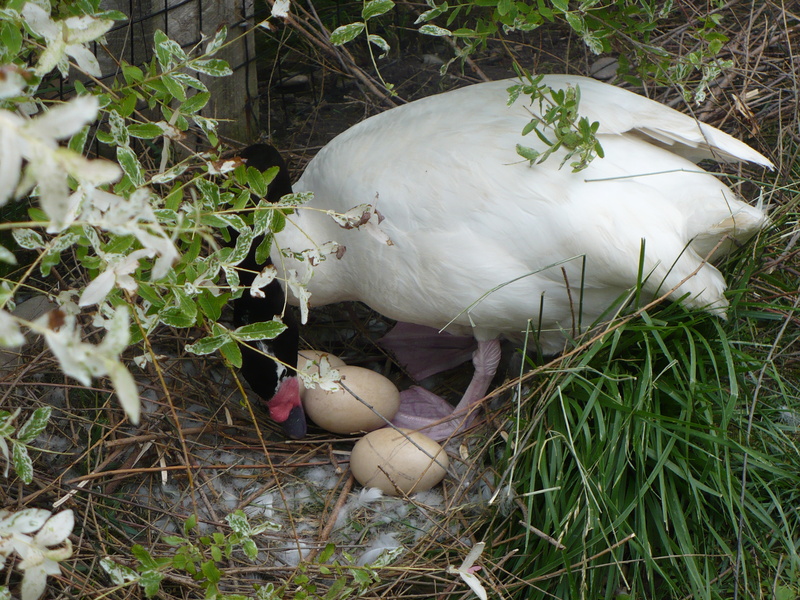 The eggs had already been artificially hatched by the Aviary staff. Photo: Nurin Merchant. Copyright. 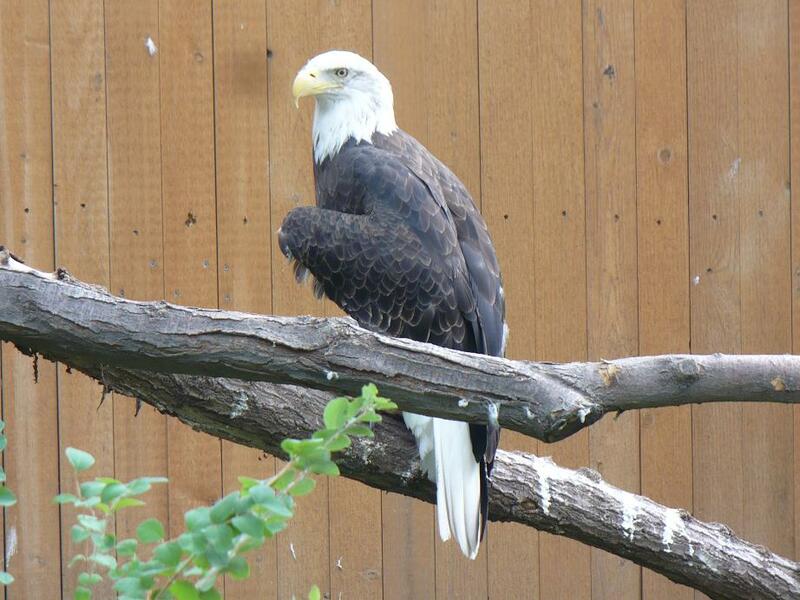 This injured Bald Eagle is no longer able to fly, so he spends his days being fed and looked after by the staff at the Tracy Aviary. Photo: Nurin Merchant. Copyright. 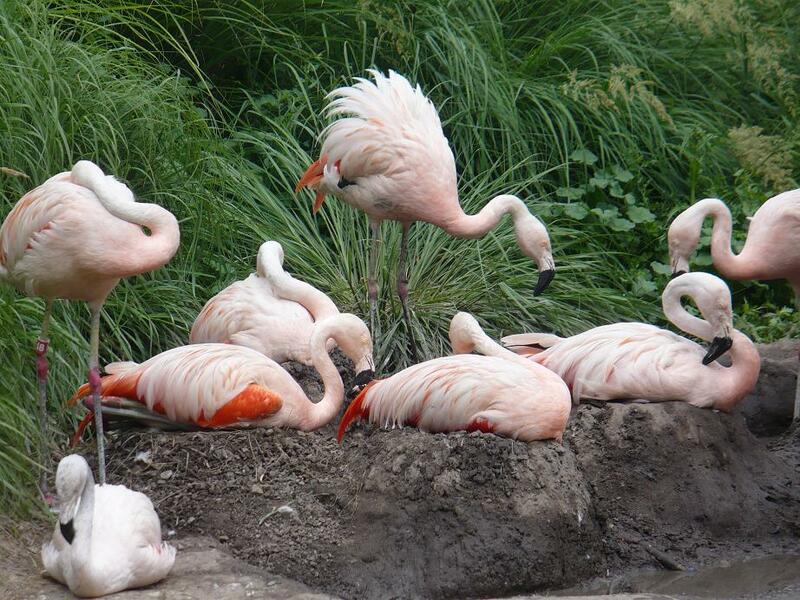 Flamingos at the Tracy Aviary. Photo: Nurin Merchant. Copyright. 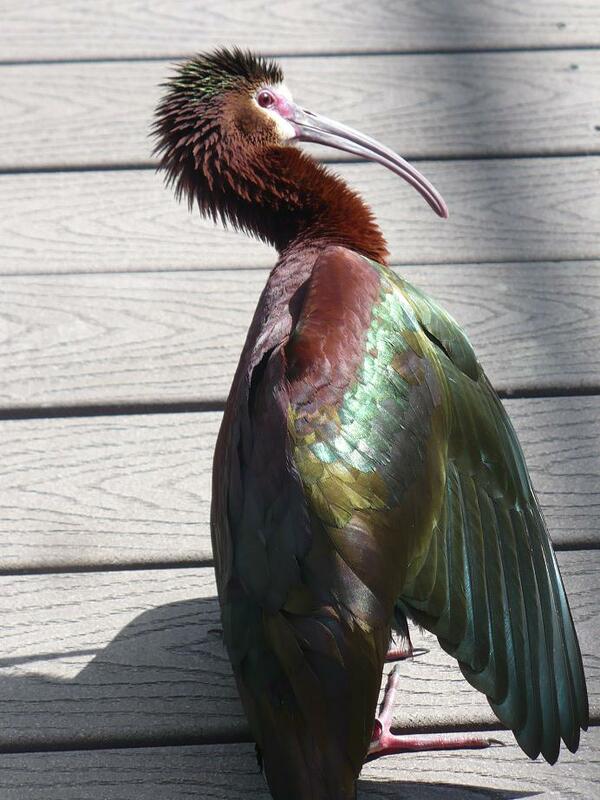 A bird showing off his beautiful feathers while sunbathing to remove irritating insects at the Tracy Aviary. Photo: Nurin Merchant. Copyright. Two full days in Salt Lake City gave us what we wanted. Our next destination was the Grand Teton National Park, located to the South of Yellowstone, and a five hour drive from Salt Lake City. Monaco Hotel had provided us excellent comfort in Salt Lake City. After a wonderful breakfast at the hotel’s excellent Bambara restaurant, we departed for Grand Teton. At a gas station, not far from the hotel, I realized I was missing my blackberry, which I thought I had left in the car overnight. We drove back to the Monaco, where it lay in the reception’s drawer – I had left it on the counter the day before when I had briefly stopped by to reset my room key the previous night, which had been deactivated by the blackberry! The drive to the exciting Grand Teton National Park, via Jackson Hole, was finally underway. Hotel and Restaurant Summary Salt Lake City: We stayed at Hotel Monaco in downtown Salt Lake City – excellent location, we had a very good room with 2 double sized beds, reasonably priced at an average price of $109.00 per night; the hotel has a highly acclaimed Bambara restaurant on the ground floor – we only had breakfast on the morning of our departure. Two other restaurants across the street provide decent breakfasts at a reasonable price. One offered the best chicken in Utah for breakfast! We had an unforgettable lunch at the Rodizio Grill in Salt Lake City’s interesting Trolley Square. Rodizio offered a wonderful Brazilian experience with its unique serving style. The grilled meats were delicious, and there was a very elaborate salad bar. Lunch for three including soft drinks/taxes/tip was appx. $80.00. Entrance fees to Antelope Island and the Kennecott Copper Mine $9.00 and $5.00 per vehicle respectively; Tracy Aviary Bird Sanctuary $7.00/6.00 adults/students. About the authors: Abdulmalik (Malik) Merchant is publisher and editor of this blog. He consults in the Information Technology field as a systems analyst/technical architect in Canada’s capital region, Ottawa. Nurin, his daughter, completed her high school International Baccalaureate program at the Colonel By Secondary School in Ottawa, and then proceeded to the University of Guelph where she is pursuing an Honours Degree in science with a special focus on Animal Biology. Malik, I more than enjoy and have also learned a great deal from all your articles. Nurin, bravo for pursuing a degree in science with a special focus on Animal Biology. How about photography? Have you considered an internship with “National Geography”? As a Mom, RN, BSN we wish Nurin all the success in pursuing her higher education. Thanks for sharing few beautiful pictures from your travel experiences. career doing travel books. Thanks for sharing this with us. A great travel essay with some spellbinding photos. Well done both of you! Makes it even more memorable when you travel with a loved one to places of spectacular beauty. Utah and Wyoming, two states where I roamed back in the 70’s ( with loved ones too) are still etched in my brain forever. A wonderful account, and you must have enjoyed. I really like your photography and your writing as well. A wonderful job. Thanks. Thank you Malik for sharing such fabulous photography and so well written account of your trip. Yellowstone is now definitely on my bucket list!! Really great photos and great commentary. Nurin has a sharp eye for photography, the photos really are outstanding. You two would have a great career doing travel books. Malik your writing is wonderful and it kept me intrigued. Thank you Malik and Nurin, Excellent Photography. Have visited Yellowstone and found it amazing. A must see. Incredible, amazing and outstanding photography by Nurin. Thanks for sharing your experience with us.. Maybe my next trip with the kids will be Yellowstone park. Nurin – great composition on your photos, you definitely have an eye. Nurin and I thank you and Aziz Kurwa, Parviz, and Shirin Hirji for your feedback on the Website as well as other readers who have sent personal emails complimenting Nurin’s work and the narrative. Of course over the next week we are covering the remainder of the trip which will include a diverse and captivating selection of photos of the Grand Teton National Park and Yellowstone National Park as well as the Mesa Falls and Park City. Please visit the Web site again. Dear Malik and Nurin, It is wonderful to see the photos and read your descriptions of all the places you visited. Made me think I was there with you. Hopefully, I will make the same journey one day. Dear Malik and Nurin, It was wonderful to read about your eventful holiday in Yellowstone Park. For a long time I have desired to visit the park but have not managed it yet. Your descriptions and Nurin’s photos have rekindled my desire. One day it will happen and your descriptions will help to enjoy the trip. Thank you so much for sharing this wonderful information. Father and daughter look good in the picture.